Click here to see the first post in this series. So, I didn’t finish every task on my list, but I made excellent progress! Workspace in the garage was my limiting factor this week. 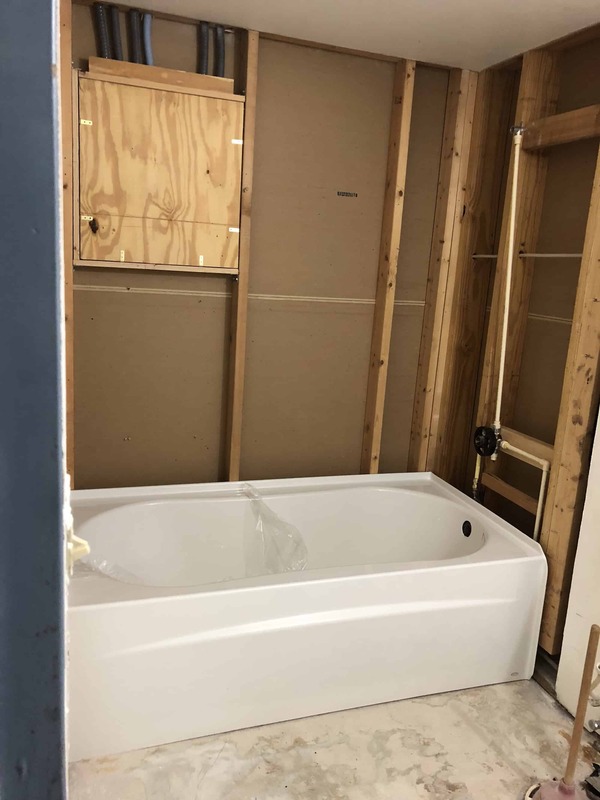 We put the tub in its box in the garage, so until that was installed, we had limited space for working on other projects. A view of the garage, with all the works in progress. We set up saw horses for the bookshelf in the front. The cardboard under the saw horses is the box from the tub! The main workbench is behind that, with two bookshelves leaning against it waiting their turn for paint. The loom pieces are not visible, but are laid out on that workbench. The small workbench to the right is usually the home of small tools, including a vise and belt sander. We moved those tools to the wire shelves on the left so I could put another bookcase on the small workbench. If I finished the task, it is in green text. If the task is in progress, but not finished, it is in orange text. If I haven’t even started the task, it is in red text. Get the tub installed. 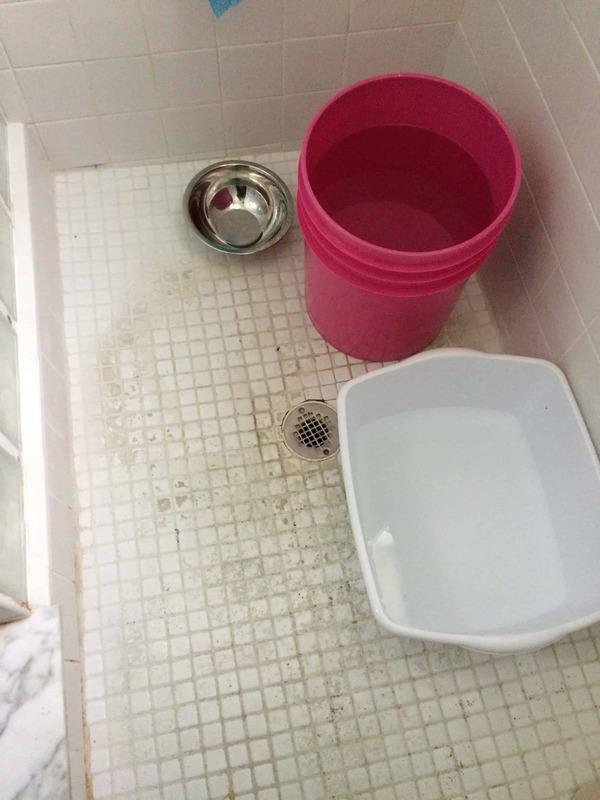 The plumber was here last week to install the tub, but wasn’t able to shut off the water to the house. 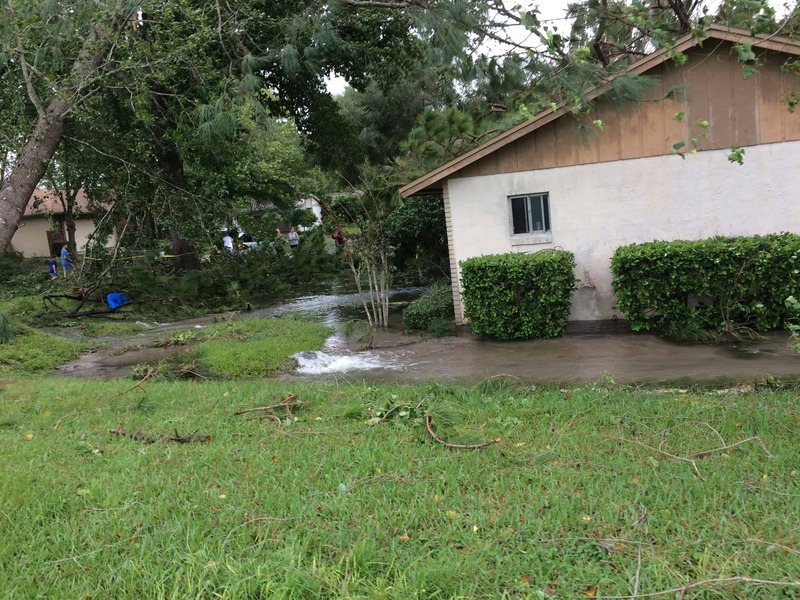 The water company was here this morning and didn’t have any problems with the valve on the meter. Today I need to call the plumber to reschedule tub installation. On Monday, I called the plumber and made an appointment for Tuesday afternoon. The plumber’s Tuesday morning job turned into an all day job, with additional tasks added after he arrived on site there. He came to our house and installed the tub on Wednesday. Yes, that was July 4, a federal holiday in the United States. It was a regular work day for him, however. Learn to spackle and finish spackling the ceiling in the bathroom. Chris has done all the spackling (I love that autocorrect turned that into ‘sparkling’ — is he a Twilight vampire and I haven’t noticed?! ), but it is killing his back so I’m going to finish it. I’ve never spackled before, but it can’t be that different from icing a cake, right? I didn’t get to this due to workspace issues. 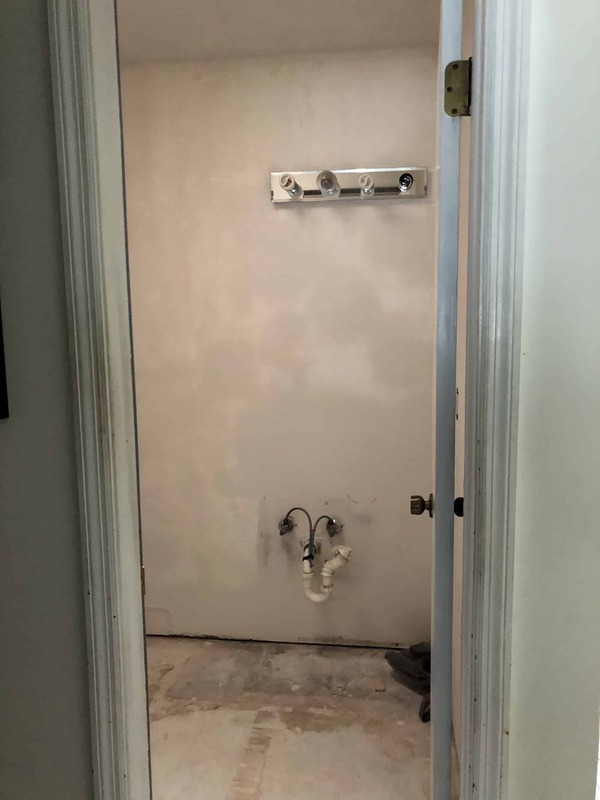 I wasn’t going to do any work in the bathroom until after the tub was installed, but I was hoping to get to the practice sheet. I have a 2 foot square piece of drywall so I can practice. However, I didn’t have space to put it on the workbench in the garage. Finish sampling varnish options for the bathroom vanity. I made 6 samples, all with the same color varnish (Minwax Espresso). I applied a wood conditioner to the top three samples, but not the bottom three samples. I then applied 1, 2, or 3 coats of varnish to each sample. We decided to varnish the vanity cabinet rather than painting it white. The dark tile is the floor. The other tile pieces will be in the tub area. The six samples I did are on the floor tile. I did not get to this due to workspace limitations. It looks like this task will be pushed forward to the week after this one. Installing the bathroom vanity is one of the last tasks for the bathroom project, so the cabinet doesn’t need to be ready yet. Finish all coats of Danish Oil on the loom I’m refinishing for Lorelle. This is necessary to have space to work on the looms that are in the storage unit. I did not mention last week that I have worked on this project for several weeks already. I disassembled the loom, sanded it back to bare wood, and started applying coats of Danish Oil. Each side of each piece of wood gets 4 coats of the Danish Oil. I apply the second coat 30 minutes after the first coat. After the second coat, I wait about 15 minutes, then use a clean cloth to wipe off any oil that hasn’t penetrated into the woods. A few hours later, I use a little Mineral Spirits to wipe off any oil that might remain on the surface of the wood. I apply the third coat at least 24 hours after the second coat. I wait until the wood feels dry to the touch. 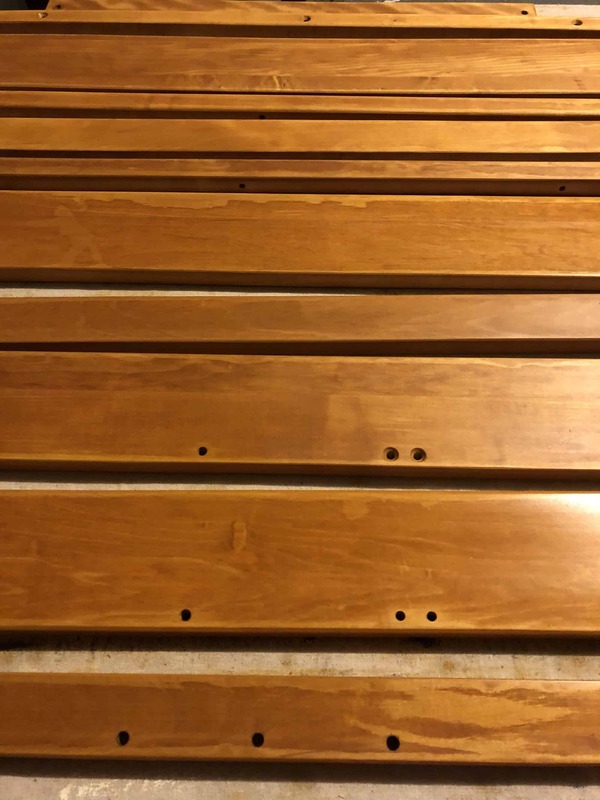 Since I live in Florida, it is summer with high humidity and nearly daily rain, and our garage is not air-conditioned, it often takes 36 hours or more for the wood to feel dry to the touch. If it is taking too long, I will use more Mineral Spirits to wipe off any excess oil. I use 800 grit wet / dry sandpaper to apply the last coat of the Danish Oil. I immediately wipe off any excess oil. A couple of hours later, I use the Mineral Spirits to remove any remaining oil. The fourth coat is the trickiest. Any oil that doesn’t penetrate into and bond with the wood will not thoroughly dry on the surface of the wood. 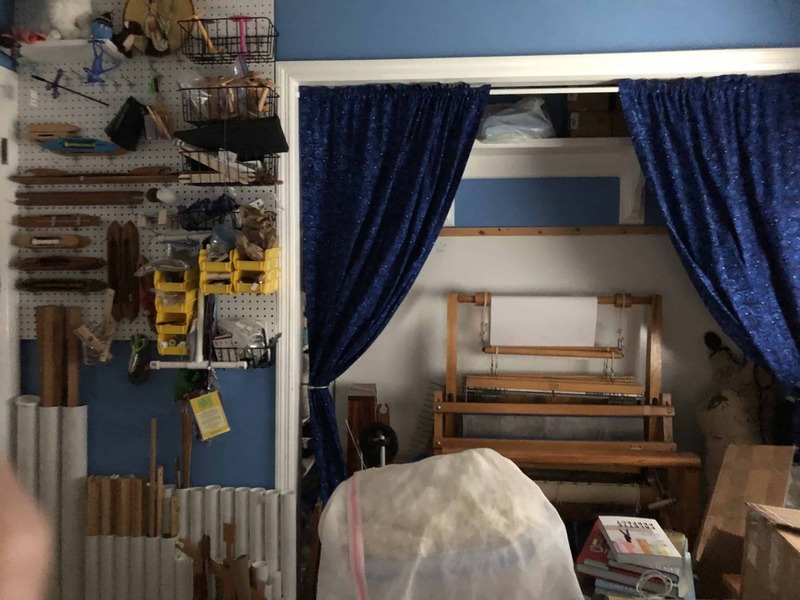 It becomes tacky, which is the problem I faced with my own rigid heddle loom and spinning wheel (see a conversation about that in this post). If I find any tacky spots after the wood is otherwise dry, I lightly sand those spots with the 800 grit wet / dry sandpaper. This rubs off the excess without harming the finish. I was able to fit 1/2 of the pieces on the workbench at once. Since the pieces lay flat on the workbench, I have to do one side of the wood at a time. This means it takes a minimum of 8 days to do 1/2 of the pieces. Last Sunday, when I put this project on my task list for this week, I was starting on the second side of the second 1/2 of the pieces. Today I applied the fourth and last coat to those pieces. I’m leaving this task orange because the pieces will stay on the workbench until they are dry. In addition, I still need to apply Danish Oil to the harnesses. Since they have an awkward shape, the four harnesses will take up the entire workbench. Chris does have an idea for suspending them so I can work on both sides at the same time. We’ll see if it works! 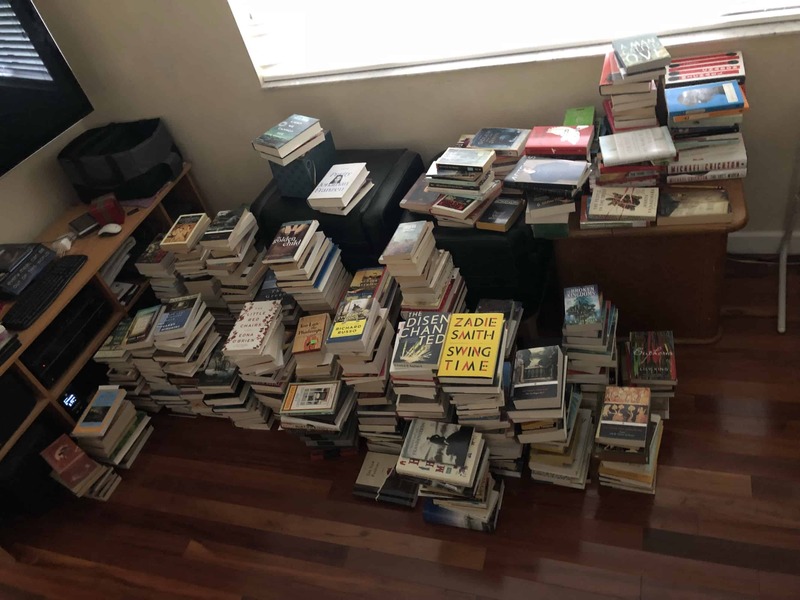 Sort through all the books. Donated any unwanted books to the library. 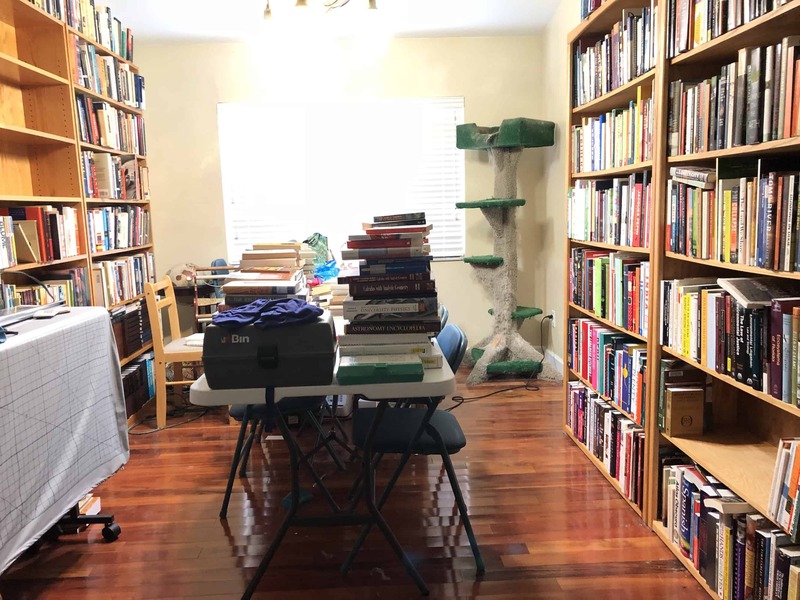 I sorted all the books! 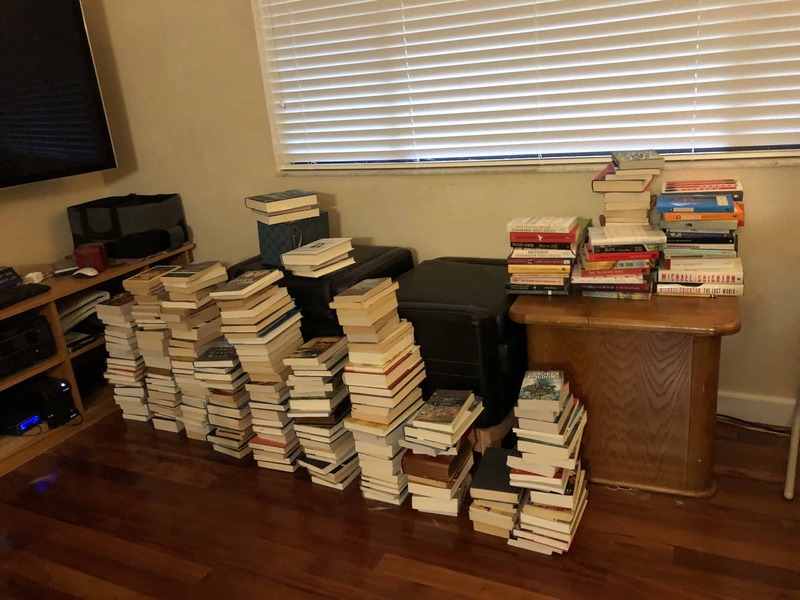 I found at least 100 books to donate, and they are sitting in bags and boxes by the front door waiting to go to a new home, I just haven’t gotten them out of the house yet. 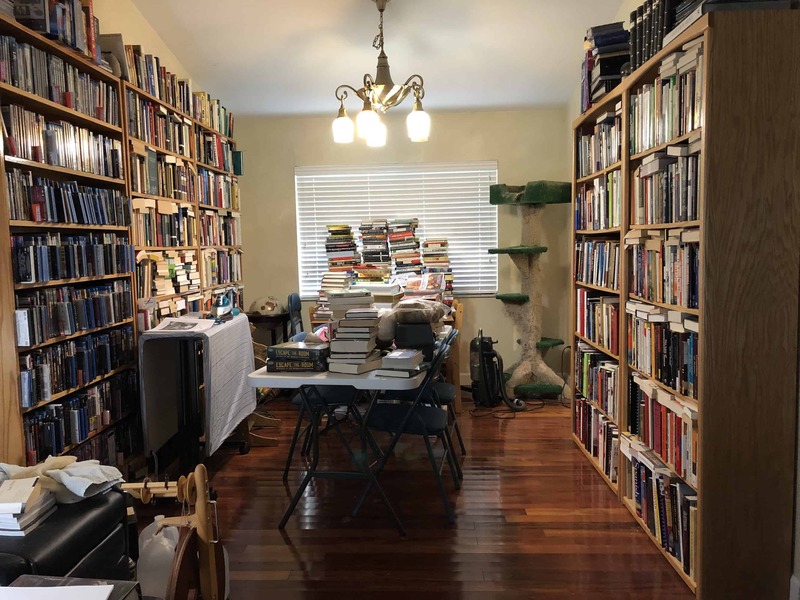 If you look at last week’s before pictures, you might notice that many books are shelved in piles, with spines not visible, or shoved on top of books. In order to get everything grouped by subject and sitting on shelves, I had to rearrange all these shelves. 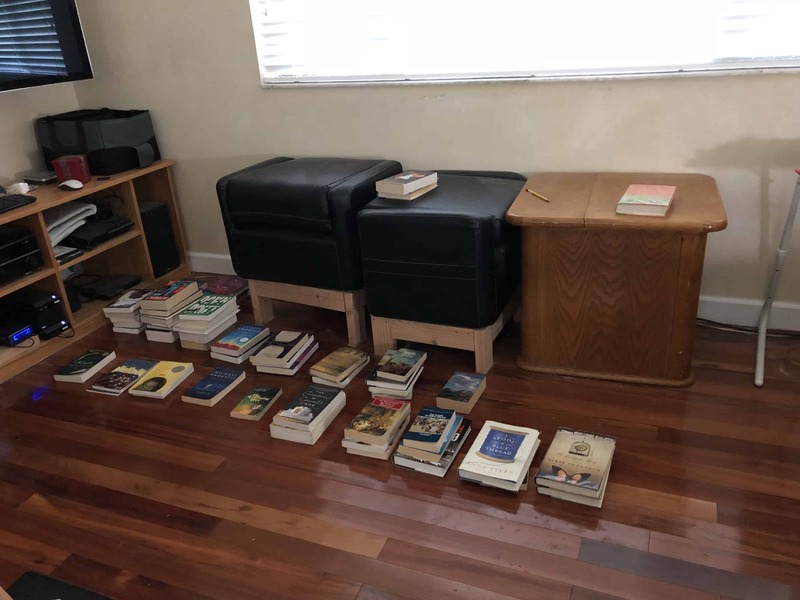 Every book came off and was moved to a new home. 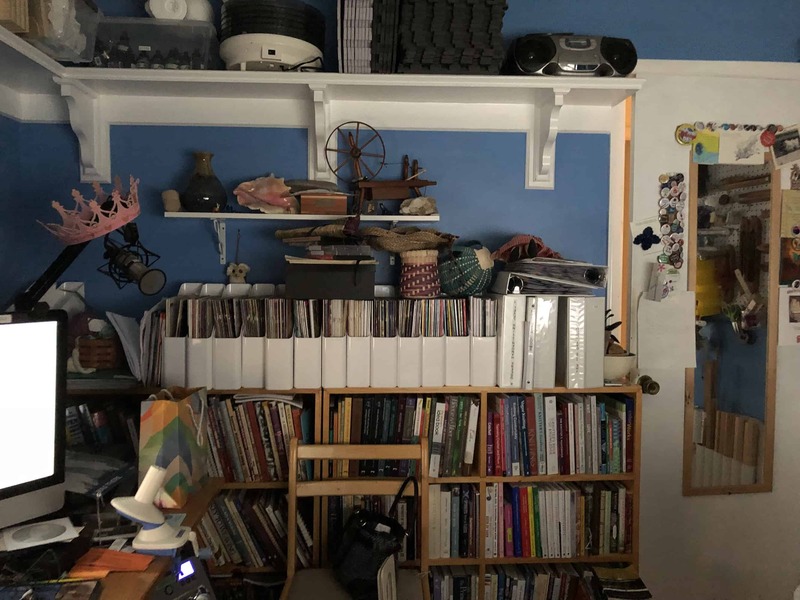 I did two or three shelves at a time, as I did not have enough space to take everything down and sort it at once. The ‘after’ picture. The books still on the table are either library books or books which will be shelved in the sewing area once those shelves are cured. Notice how you can see the window shade. If you look at last week’s ‘before’ picture, you will notice there are piles of books blocking most of the shade. Just starting to sort the fiction books. I made piles for each letter of the alphabet. Several letters required multiple piles! 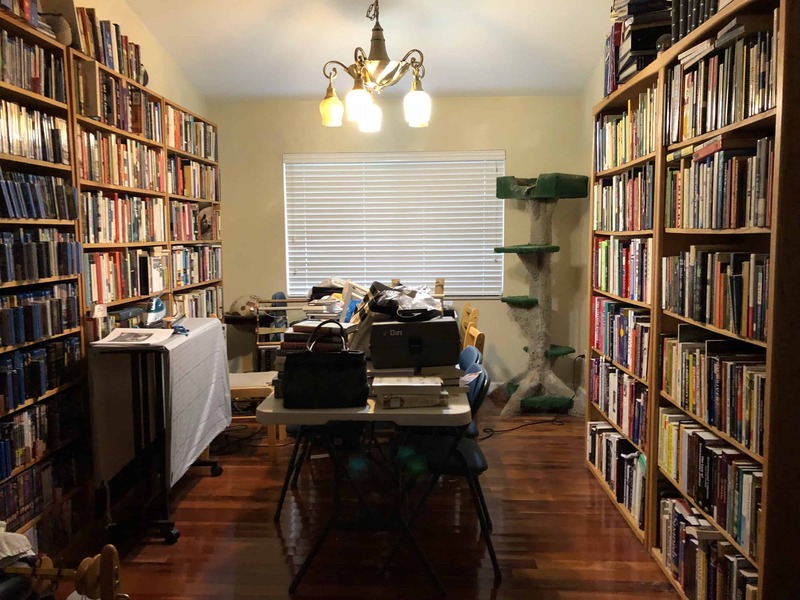 All 800+ fiction books, sorted by first letter of the author’s name. Books waiting by the front door so I remember to bring them to the library. Paint the four bookshelves I bought from the used bookstore that went out of business on Saturday. Canary yellow = not a good look for our space! I finished painting three of the four bookshelves. 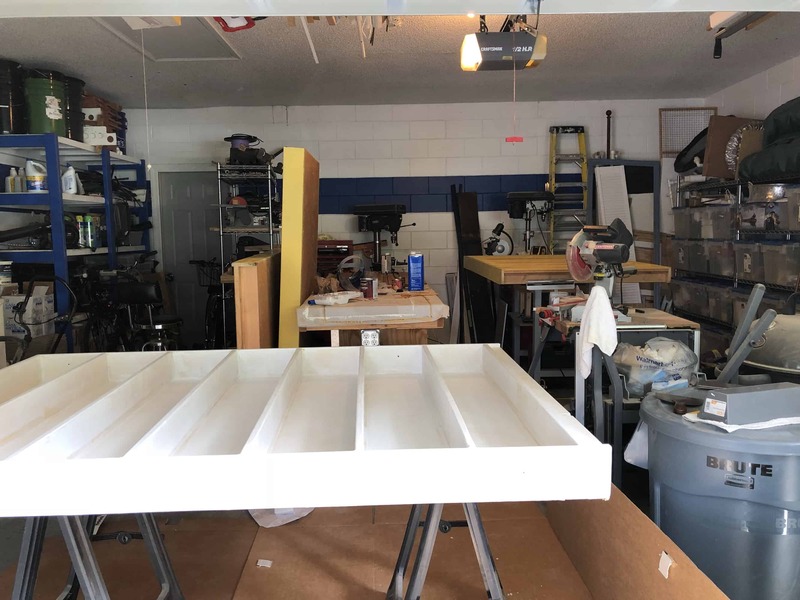 I just finished painting the first coat on the fourth bookshelf. I will paint the second and last coat on the fourth bookshelf before I go to bed tonight! Sell 4 bar stools and the TV from the ‘family’ room. I did list the bar stools on the Facebook group for my neighborhood, but did not get any nibbles. I need to try some other venue. Take the two tables out of the family room, remove bar-height legs, and add standard-height legs. Chris and I plan to work on this tomorrow. Put bookcase from hallway on top of family room entertainment center and use it as temporary storage for dyeing supplies. The long-term plan is to build a matching cabinet for the top of the entertainment center, but that won’t happen this week. Done! See the picture below, under the bookcase installation task. Get the cart out of the family room and back to the garage. Find new homes (either here or by donating) for everything stored on it. I put some of the items on this cart on the bookcase that is now on top of the entertainment center. 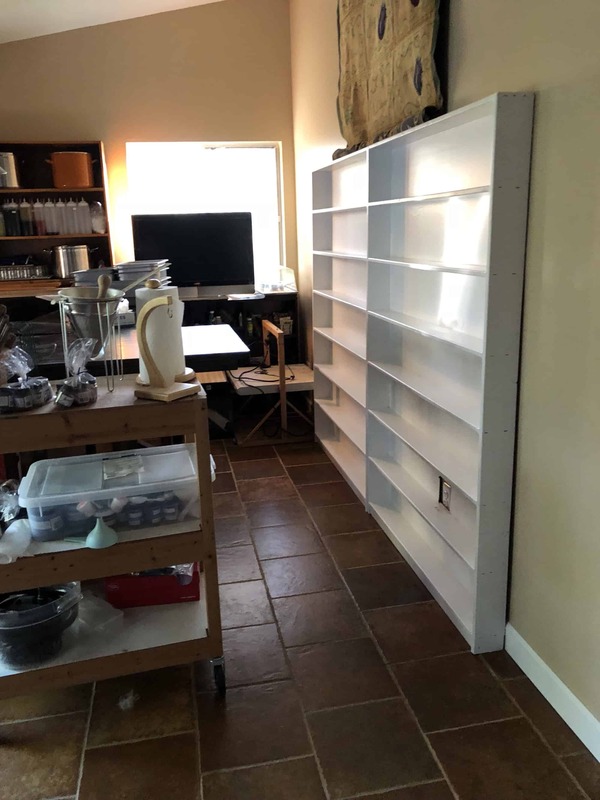 Some of the dyeing supplies which are on the cart will live on one of the new white bookshelves. I want to let them to cure for one more day before I put anything on them. Thoroughly clean the floor on the side of the family room where the tables are. Done! There’s not a good way to get a picture of this. Install all the newly painted bookcases: 3 in the family room, along the wall, and one in the hallway to replace existing shelf. The only shelf not yet in place is the one that I will finish painting today. Two bookshelves in place. See also, cut off on the left, the bookshelf that was in the hall is now on top of the entertainment center, and dyeing tools are at home on it. Also note the bookshelf on the right has a cut out so we can get to the plug behind it. I cut it out myself! It is the first time I’ve used a jigsaw and I did not do a great job with straight lines. I am pleased that I measured correctly and got the cut out in exactly the right spot. The new view down the hallway. I’m going to do something about the side of the bookshelf, but haven’t decided what yet. Paint? Weave a runner and attach it to the side? Put the standard-height tables back into the family room. Since we haven’t modified the tables yet, this task is not yet complete. If the bookcases are sufficiently cured, shelve all books. This may need to wait for next week if the bookcases aren’t cured. I put the first shelf I painted into the hallway and shelved books on it. The remaining books will be shelved on the unit that I will finish painting today. I will move that shelf into place tomorrow, but will wait at least 24 hours for it to finish curing before I shelve the rest of the books. The books on the hallway shelf. The fiction books that still need to be shelved. Return folding table to Shellee once I shelve all the books. Since the books are not all shelved, I haven’t returned the table yet. Bathtub surround. Chris will be doing a lot of this work, but I expect to help. We need to make a final plan for the tile design. We need to decide the location, size, and layout of the niche. We need to frame out the niche and install all the cement board. Once the cement board is installed, we apply waterproofing material to all the seams and corners. Once that sets, we install the tile, then grout the tile, then seal the tile. I do not think we will get to the tile installation point this week. I expect we will get all the cement board installed and apply the waterproofing material. Decide what we are doing re: storage cupboard and lighting in the bathroom. We have narrow glass shelves which Chris rescued from his parents’ basement after his father passed away. He is going to build a large medicine cabinet for the bathroom and use those shelves inside it. We are discussing two options for where it might hang: over the sink, in which case we will use mirrors for doors, or over the toilet. We also need to decide how to install it. Do we hang it on the wall? Or recess it into the wall, like a medicine cabinet. I suspect we will need to hang it on the wall, because it looks like there’s an electrical wire running through the studs all the way across, and that would interfere with recessing it. 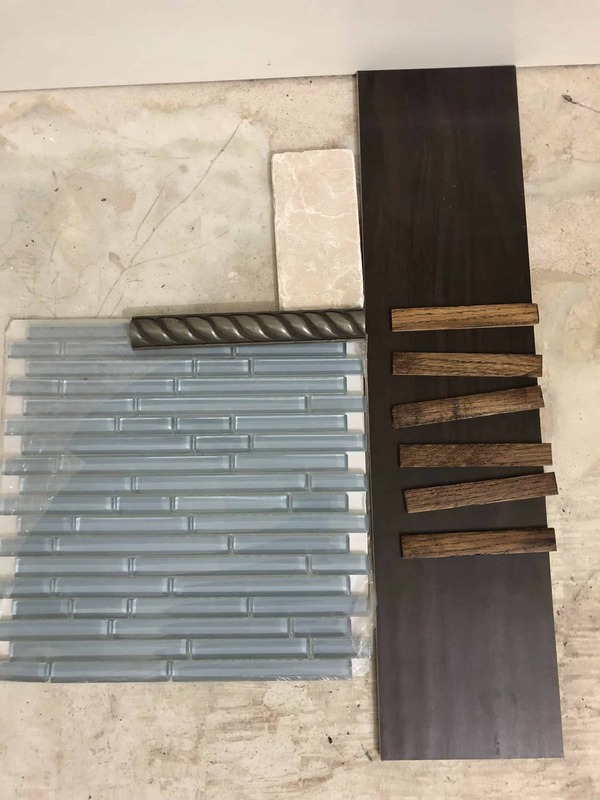 If we are going to hang it on the wall above the sink, we need to make sure that whatever light fixture we chose will not be blocked by the cabinet. Apply Danish Oil to the harnesses for Lorelle’s room. If Chris’ idea re: suspending them works, I will be able to finish this task this week. If I have to lay them flat on the workbench, I will not be able to finish until sometime next week. Get some naval jelly and soak the rusted metal parts for Lorelle’s loom. Empty the storage unit no later than Thursday. Bring books to the library for donation. Install final bookcase in back room. Shelve remaining fiction books on that bookcase. Transform bar height tables into standard height tables and put into family room in front of bookshelves. While I was typing this post, Chris suggested improving the cart so we can put it in the kitchen. 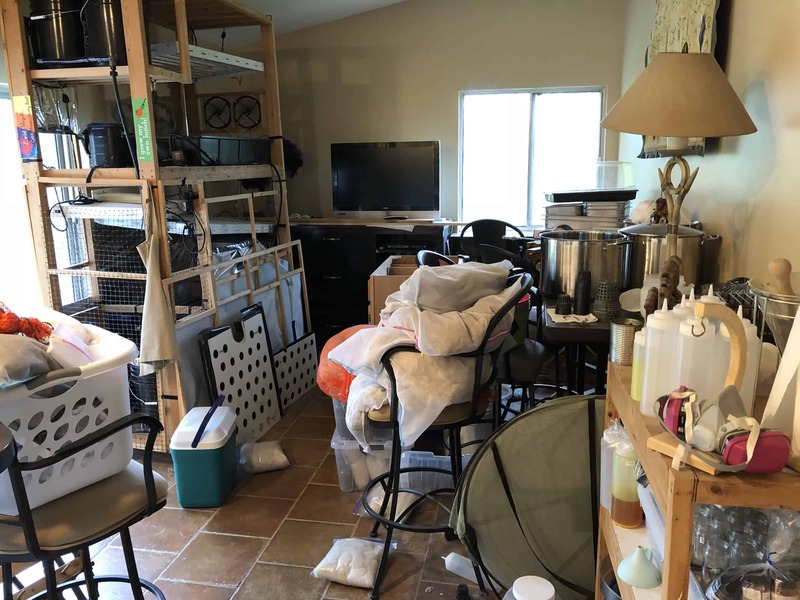 I could use some extra counter space and storage in the kitchen — kitchen organization is part of month two of this household organization project. Chris will add a maple butcher block to the top of the cart. He will put a nicer, easier to clean, surface on the two shelves. I will use the leftover bookshelf paint to paint the legs and sides. Return folding table to Shellee. Remember to bring her the Tupperware bowls. Move sewing machines and serger onto the new sewing tables. Shelve creativity, sewing, fashion, and dyeing books on one of the new shelves. Determine which sewing tools and supplies need to be stored on the new shelves. Go through the canning jars in the garage and find the appropriate sizes needed for storing tools and supplies. Do I need to buy lids and / or rings? Yesterday, Chris moved all my website database to the new host. I figured I would write a new post to make sure everything is working properly. Good thing I did — turns out my theme broke when we moved to the new host, so I had to install a new one. I have more work to do on visuals — the logo I was using was too big for this theme, so I cropped it. I’d rather make a new logo to fit properly, once I decide if I’m sticking with this new theme. I’ve decided that I’m going to use this blog as an accountability tool for the next couple months. I’m going to post weekly, aiming for Sunday, with what I’m trying to accomplish in the next week and what I actually accomplished in the last week. 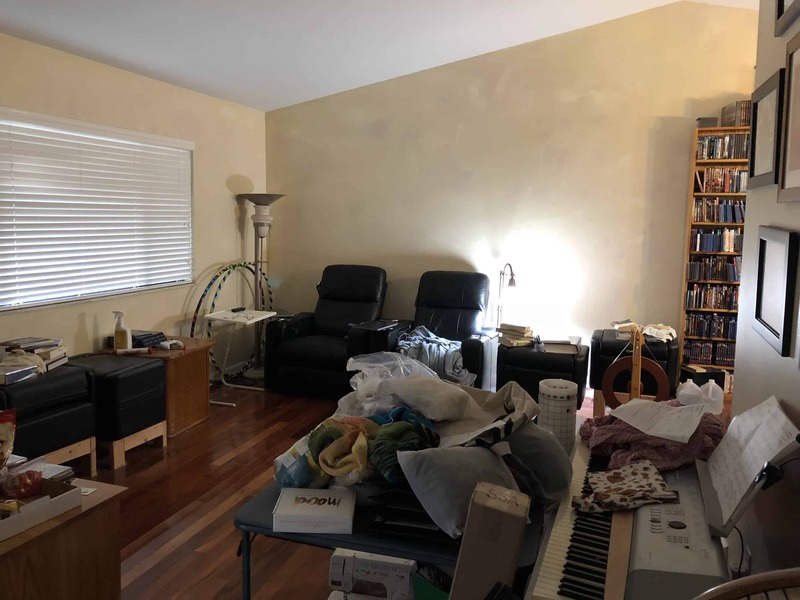 As I mentioned in my last post, several rooms in our house aren’t really functional due to the accumulated detritus of the last few years. For the next couple months, I am focusing on returning this house to a functional home. 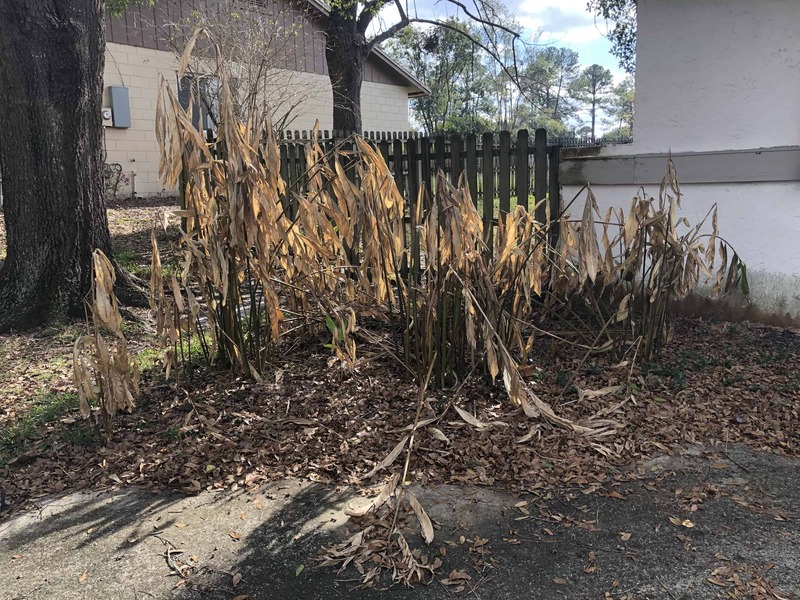 Here’s the confession part — actual pictures of how it looks now. Looking from the hall into the bathroom. Where the tub and toilet should be. The bookshelf and a corner of the desk in my office. My desk, where I’m sitting and writing this blog post! Looking straight through the door into my office. The loom is sitting in what is meant to be the closet in my office. The prior owners of the house removed the doors and built shelves into the sides. We left it that way. This room, located off our kitchen, is intended as a family room, but we’ve never used it that way. We used it as a dining room for a while, but for the last 7 years or so it’s been hydroponics and miscellaneous storage. The dining room / library. Finish the bathroom before we have a houseguest in early August. Create a sewing / crafting area in the ‘family’ room. 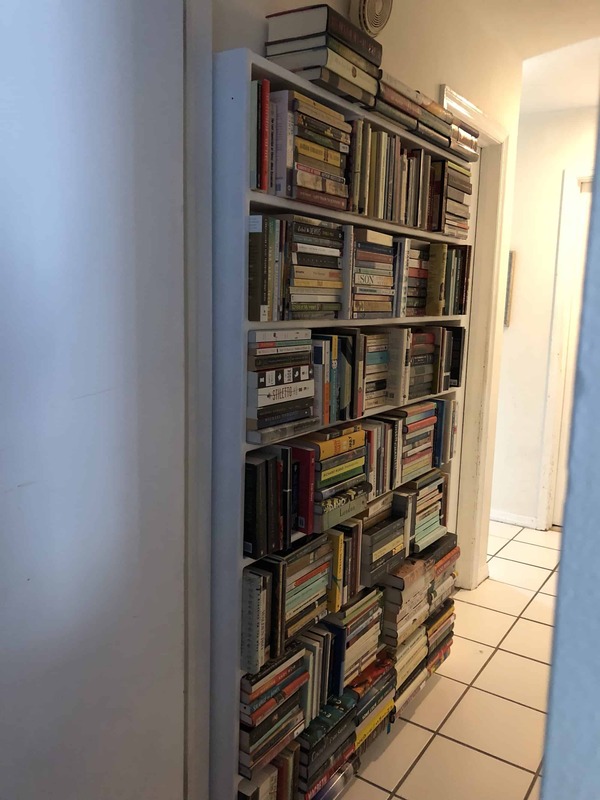 Sort through books and find storage solutions for them. Turn office into a functional space. 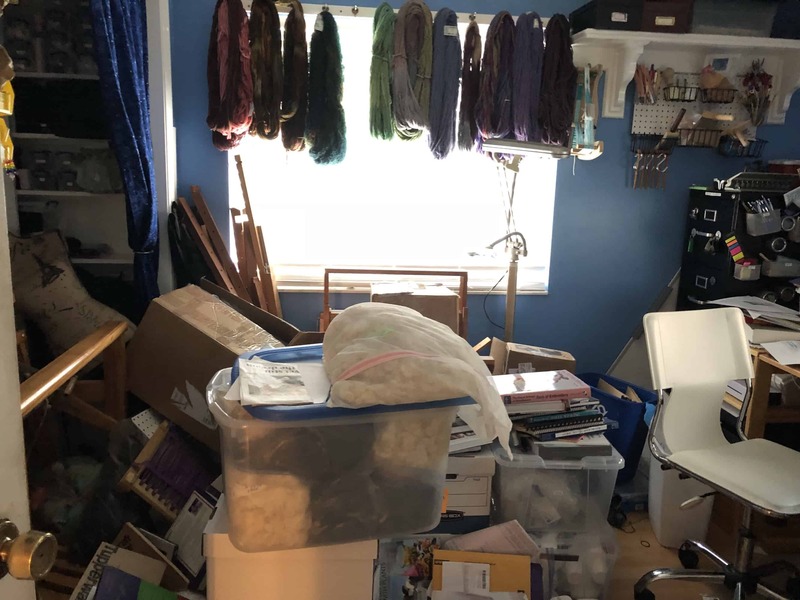 Get remaining looms out of storage unit (not pictured) before the next payment is due on July 13. Learn to spackle and finish spackling the ceiling in the bathroom. Chris has done all the spackling (I love that autocorrect turned that into ‘sparkling’ — is he a Twilight vampire and I haven’t noticed?! ), but it is killing his back so I’m going to finish it. I’ve never speckled before, but it can’t be that different than icing a cake, right? Did I finish all these tasks? Find out in post two of this series. Those of you who know me, or have read this blog for a while, know that the last few years have been challenging. I have spent much of my time helping other people, friends and family alike, through one crisis after another. 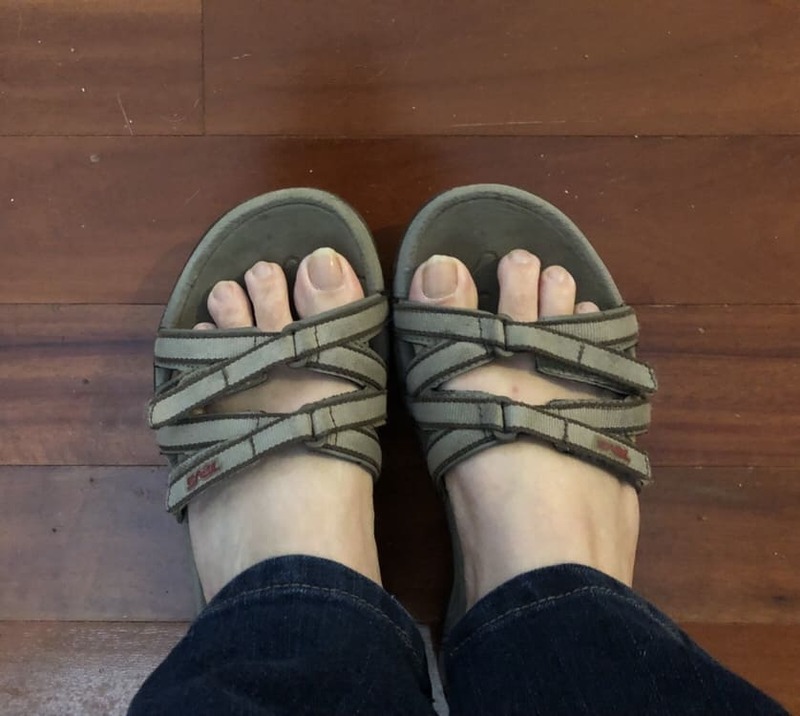 In November, one long-expected shoe dropped when my husband was laid off. In January, another long-expected shoe dropped when his mother passed away. At the same time, the other people I’d been helping came through their crises. 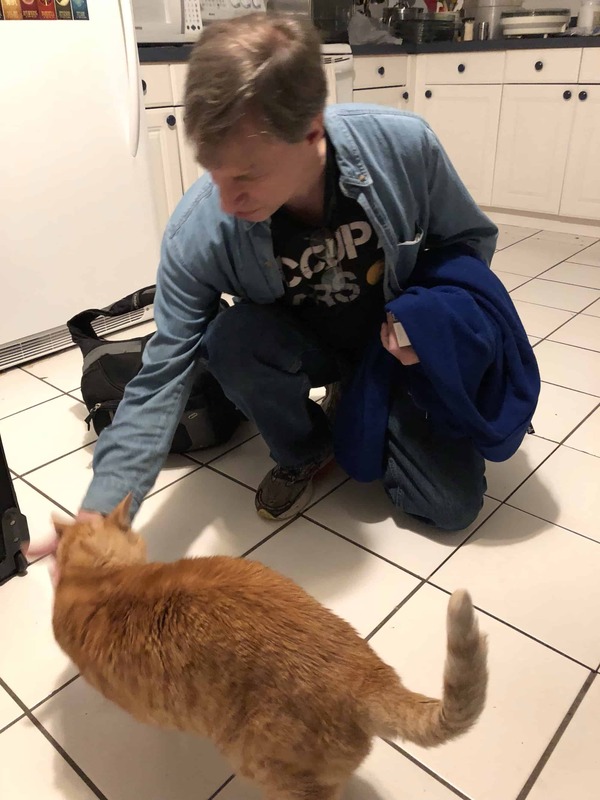 This confluence of events meant that for the first time in many years, I have been home regularly. Since returning from my mother-in-law’s funeral, I’ve only traveled once. For the first time in at least 8 years, I have no obligations to anyone who is currently in a crisis situation. This means I can make plans based only on my own schedule, needs, and abilities. It feels strange to me. So much has changed in my life over these years and I’ve felt like I was reacting to rather than shaping our circumstances. I need to relearn how to be proactive about evaluating what I need and want, to make sure I’m saying yes and no to the right things. One consequence of the chaos of the last few years is that I am surrounded by the detritus of half-finished projects and ideas. 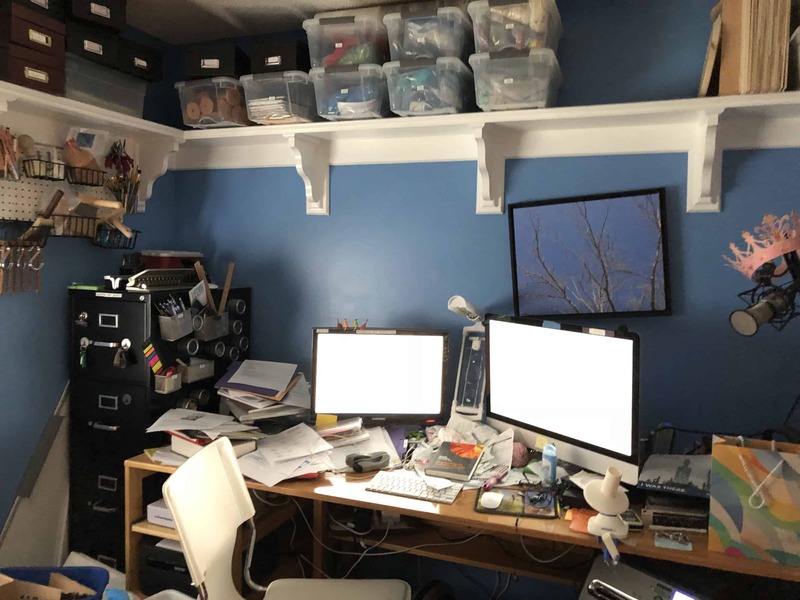 At least 3 rooms in our house (dining room, family room, and my office) are not functional due to piles of one kind or another. Fleece, paperwork, and books are spread out rather willy-nilly. I have multiple looms to repair or refinish, one for me and 3 for others. I have goodness-only-knows how many abandoned knitting, crocheting, and spinning projects. Our main bathroom, the one guests would use if we let anyone visit us, has been at least partially demolished for 2 years as of next month. It’s long past time to start digging out, getting rid of the things that no longer serve us and creating spaces where we can be productive with whatever projects we want to take on at this point in our lives. The good news is, that we’ve got a general idea of what we’re going to do next, and we’ve started taking steps to make things happen. We’ve started closing some of the open loops. 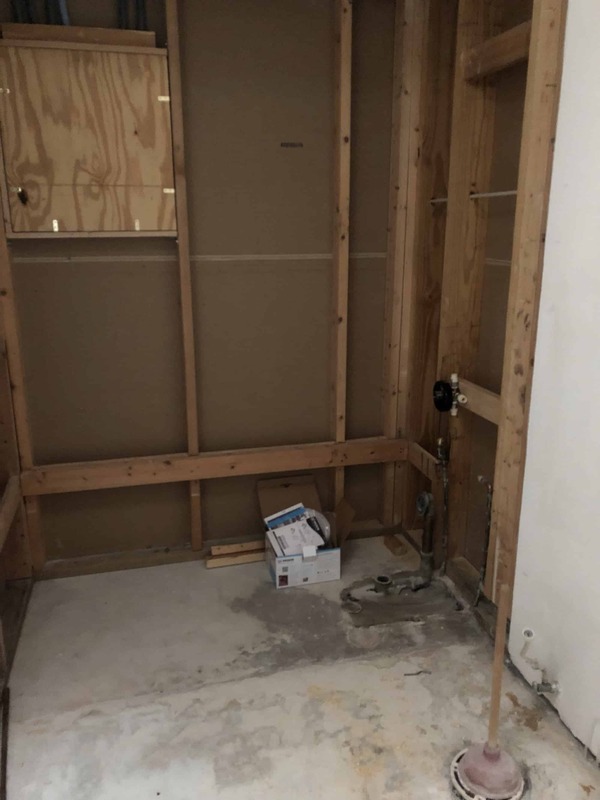 The bathroom is on track to be finished by the end of July. The first loom is on track to be finished by the first weekend in July. 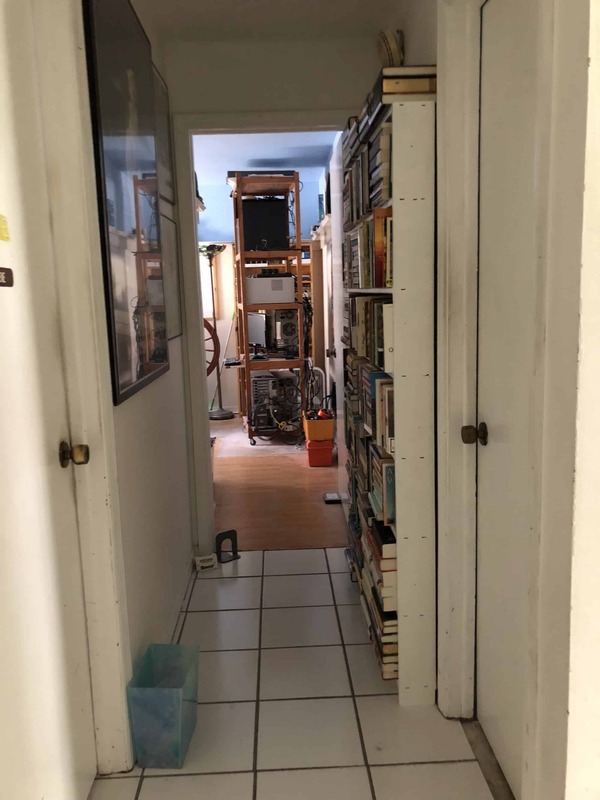 The piles of books and a sewing workspace should also be in place by the first weekend in July, thanks in part to 4 bookcases I’m buying from a local used bookstore that’s going out of business. One of the other major projects I’m undertaking right now is reconfiguring this website. I have a hosting agreement with one company. My husband has a hosting agreement with a different company, for a website he hasn’t been maintaining for a while. We are consolidating into one hosting agreement, at a third company, a move that will save us an estimated $5,000 over the next 3 years! This means I will be migrating this website sometime in the next week. The site will be down for some time (hopefully a short time) when the migration actually happens. The domain name isn’t changing and I’ll still be using WordPress as the structure, so you should be able to access the blog by the same means you do now. My birthday was several days ago. We got home from New Jersey only a few days before that. I was tired and needed to get back into a rhythm at home. I decided the best gift I could give myself for my birthday was progress on personal projects. I made progress on three projects: (1) Finishing a loom and spinning wheel; (2) Scouring fleece; and (3) Spinning a batt. 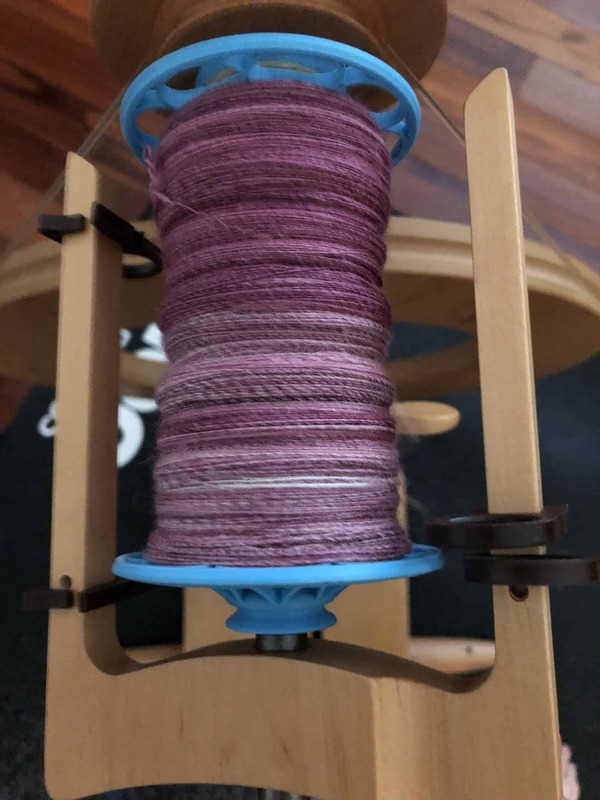 In early January, I wrote about the problems I have with the finish on my rigid heddle loom and my spinning group’s wheel. My mother-in-law passed away the day after I wrote that post. When we left for New Jersey, I left all the pieces out on the workbench. I was at a bit of a loss of how to proceed because after five passes with the mineral spirits, some of the pieces were still tacky. On my birthday, I took the loom and the treadles to our local Woodcraft store and explained what I had done so far. They said I probably put too much Danish Oil on, which is why it never dried. They said that continuing with the mineral spirits was the correct approach but that if that doesn’t work then I will have to remove the entire finish and start over. I was using paper towels to apply the mineral spirits. They suggested that I use a shop towel because the paper towel might be too smooth. Over the course of the last several days, I applied another 5 or 6 rounds of mineral spirits. Some of the pieces are no longer tacky, some have parts that are tacky and some that are not, and some are still tacky all over but are not as tacky as they were before. We continue to move in the right direction! In early January, I scoured some fleece and wrote a long post about it. That day, I only scoured a fraction of the fleece I needed to scour. The day my mother-in-law died, I was at a friend’s house, about to scour more fleece. My spinning group was holding our third annual retreat (I posted about the first one). This year, we decided to spend the day at the home of one of our members. 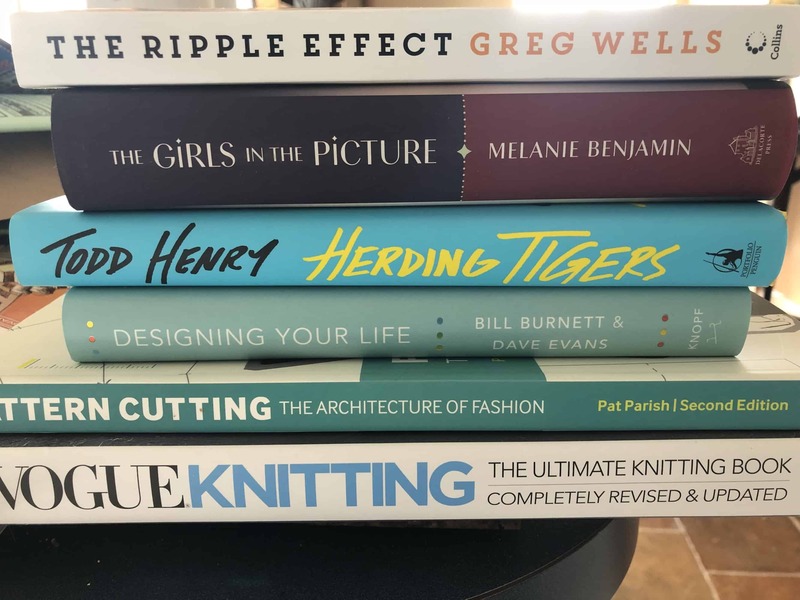 These retreats are usually low-key, bring a project and do your own thing affairs, but this year several of us had fleece to scour, others had never scoured and wanted to learn, and our hostess has excellent space for scouring, so we decided to do a scouring day. I brought all the fleece I needed to scour and all my equipment. 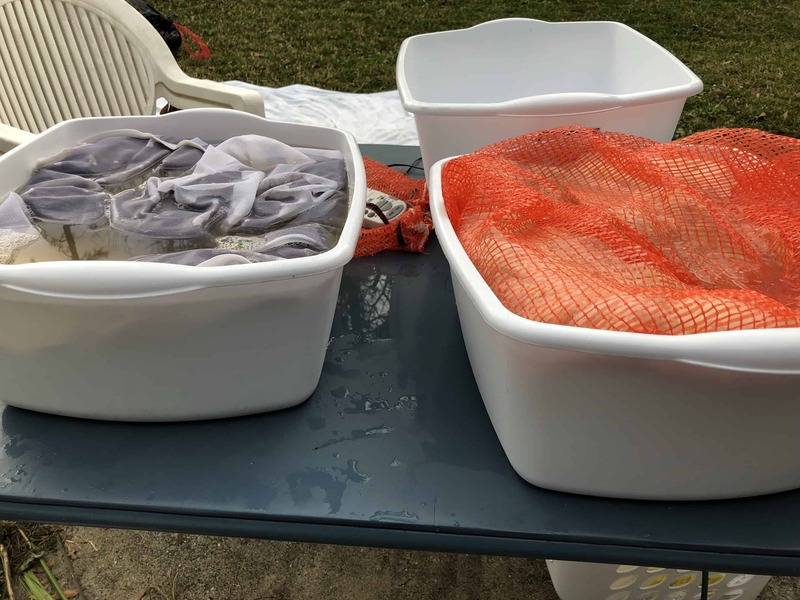 Since several of us were processing fleece and since I had several 4 – 16 ounce samples, I put all my fleece into mesh laundry bags. Inside each laundry bag, I wrote the name of the breed on a tyvek wrist band (Amazon affiliate link). I used these wristbands when dyeing and scouring because they will not dissolve in water and you can write on them with a Sharpie. I had just finished putting everything into bags and was about to start scouring when my husband called to tell me his mother had passed. I immediately packed up all my fleece and drove home, leaving my equipment behind since everyone else was using it. I picked up the equipment after we returned home. I still wanted to get all that fleece, plus additional fleece I had at my house, scoured. So I spent the afternoon of my birthday scouring fleece. Here’s all the fleece I put into laundry bags while with my spinning group. My friend Nancy told us that she and her sister now do cold soaks of fleece before scouring. I decided that I would try that method. We have a plethora of 5 gallon pails. We use them for putting water into our hydroponics system, for toting around tools, and for storing things in the garage. Last September, we bought several more to use for water storage as part of our Hurricane Irma preparations. We filled the bathtub after I took this picture. 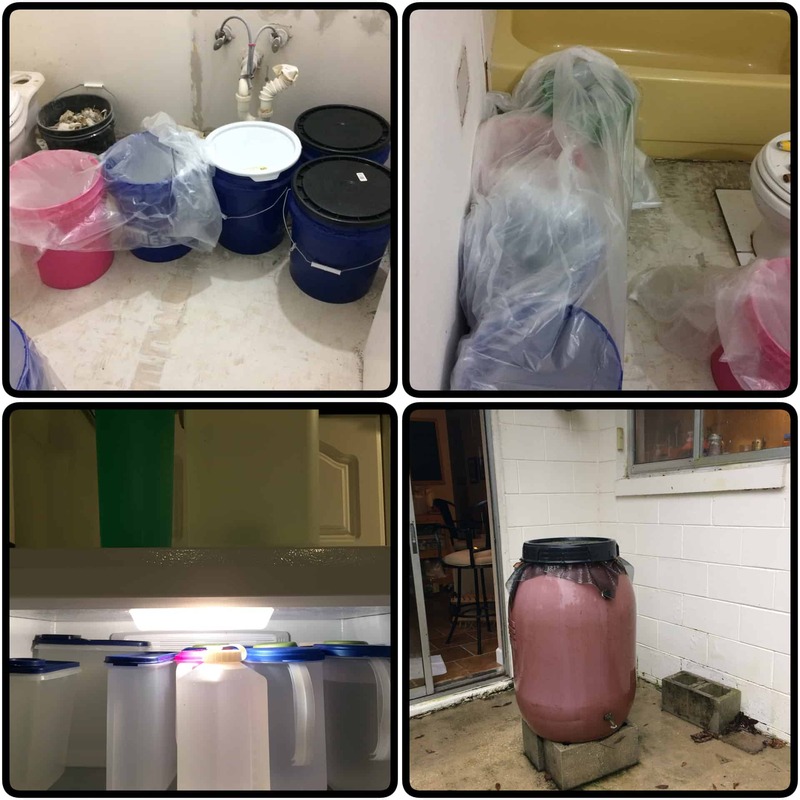 Total water storage: 35ish gallons in the tub, 50 gallons in buckets, 6 or 7 gallons in the frig, 50 gallons of non-potable water in the rain barrel. Copious water storage was an excellent thing because we were without power for 6 days, without water for 24 hours due to a water main break on our street, and on severe water restrictions (no showers, no flushing the toilet if you only peed) for a week because 85% of the lift stations in our county were without power. Lift stations move waste through the pipes to the treatment facility. If they can’t do their job, somewhere that sewage will seep into someone’s home. Six trees came down at this house, including two that came through the roof in the middle of the storm, nearly hitting one of the teenagers. 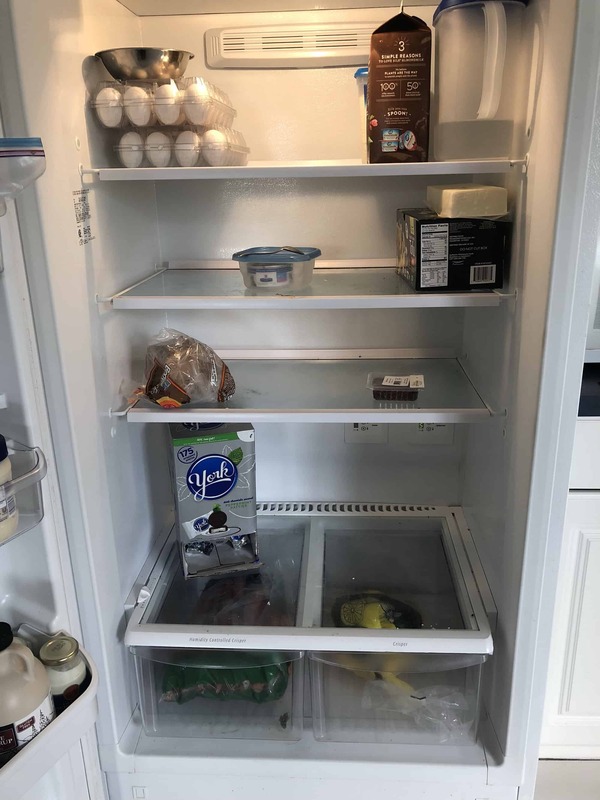 The family fled to a friend’s house. The roots of two trees pulled up through the water main, breaking it in multiple places. No running water, no showers, no electricity, high heat and high humidity. This is how we kept clean. When our power went out, the dishwasher was full of dirty dishes. After a couple of days without power, they really needed to be washed. I did it in the backyard, using water from our buckets. I did the three bucket method, with the last being a chlorine bleach rinse which meant I didn’t have to heat water on the propane camp stove. Sorry about the tangent. As I was saying, we have a plethora of 5 gallon buckets. I used those for the cold water soak. No soap, no hot water, and maybe 15 minutes in the bucket at this point. I liked the cold water presoak a lot. It is amazing how much comes out of the fleece, simply soaking it in cold water. I put the fleece into the pails to presoak, then finished setting up the rest of the equipment for scouring. 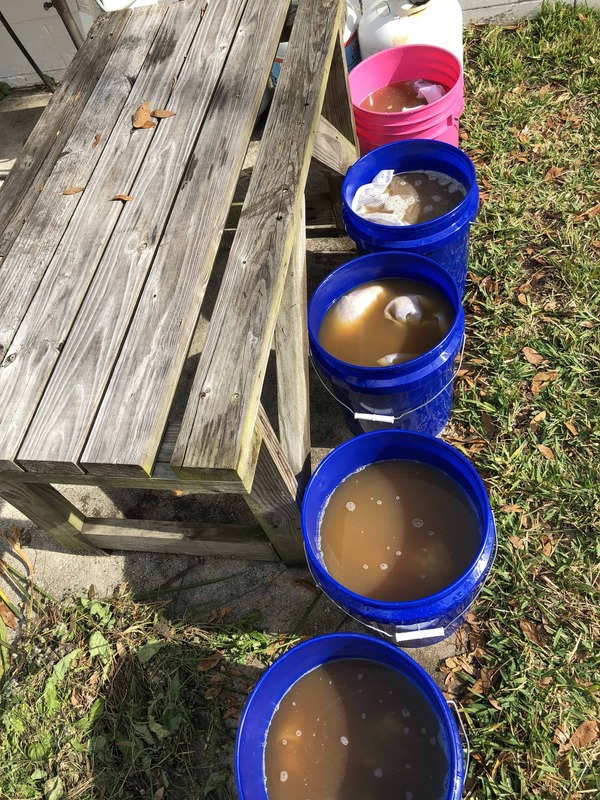 When I took the fleeces out of presoak and put them into scour, I dumped the water out, filled the pail with clean water, and put more fleece in to soak. All the fleeces were in the cold water for a minimum of 20 minutes. Some were in there for an hour or more while I scoured others. With cold water, I don’t have to worry about the water cooling and lanolin redepositing onto the fleece. Anything that came out with just cool water should stay out! I did only one scour with detergent on most of the fleece, followed by two plain water rinses. This was effective for almost all the fleeces. One particularly dirty alpaca fleece got two rounds with detergent and three plain water rinses. One or two of the greasier fleeces needed more scouring and I will be doing another scour on them. Stay tuned for more detailed blog posts on which ones needed more scouring and how I handled that. I made one other change to the process I described in my previous post on scouring. I added two more bins for scouring, so I had 6 going at one time. 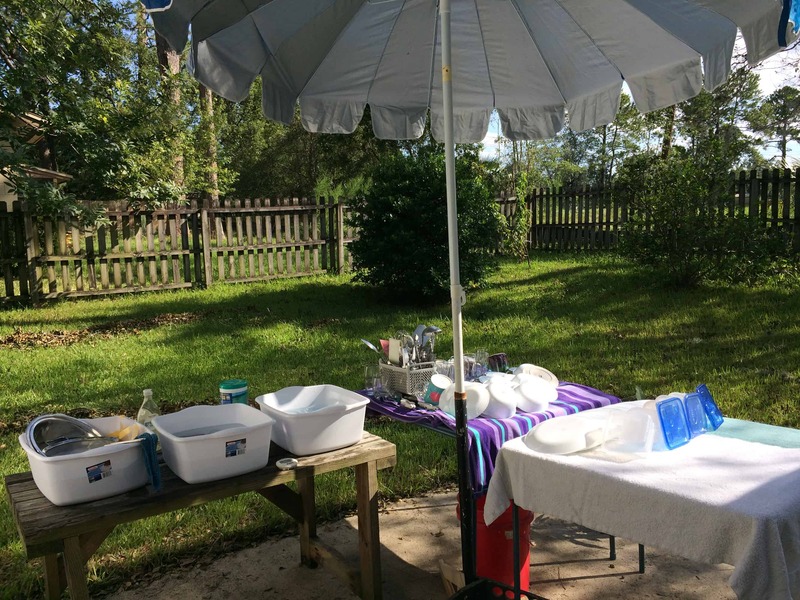 When I was at the spinning group retreat, I discovered that my dish pans hold the same volume of water as the other containers I was using for scouring, so I set up two dish pans plus the containers! 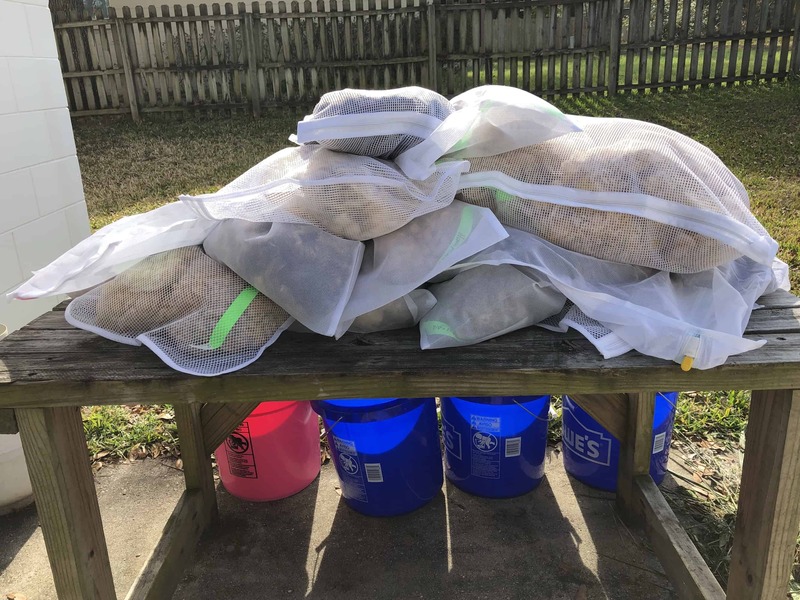 With six bins going and the presoak doing a lot of work before scouring, I was able to scour 19.5 pounds of fleece in 4 hours. I have one fleece left to scour, an 8.5 pound black Corriedale fleece that I intend to scour a lock at a time using Fels-naptha soap. Stay tuned for a blog post on that when I get it done. My birthday was the day that NBC broadcast the opening ceremonies of the Olympics, so my parents came over and we watched that while I spun. I worked on the SassyBee polwarth batt I’ve been spinning for a bit. It was an awesome birthday! 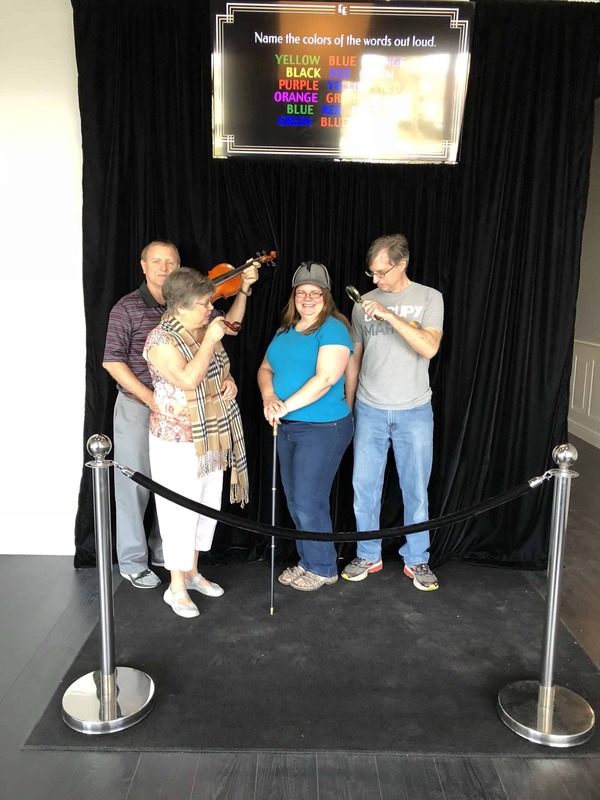 We had fabulous Indian food at a restaurant in the same plaza, then we went next door to Escape Effect and took the museum tour at the Chocolate Museum and Cafe. 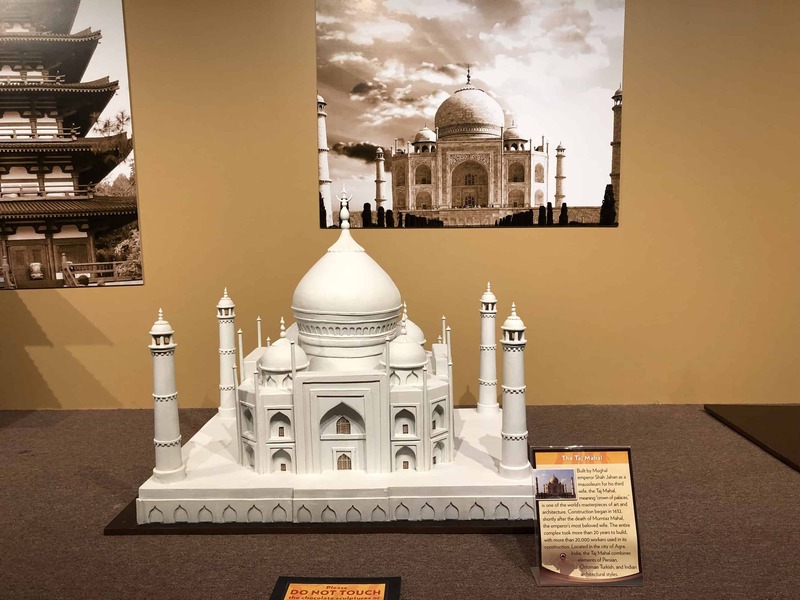 Yes, this Taj Mahal is made out of chocolate! My husband is a space geek. He’s old enough, just barely, to remember when we landed on the moon and he’s loved space ever since. We are both sci-fi geeks and Chris especially loves shows about exploration. He loves discovery and adventure. Naturally, all of this means he particularly loves Elon Musk and Space X. Tomorrow, February 6, Space X is scheduled to launch its Falcon Heavy rocket for the first time. Falcon Heavy is a BFD. The stats on it are impressive. Rather than reciting them, I’m going to refer you to Space X’s website. The important thing is that this is the first launch of a rocket that could be used to put humans back on the Moon or to land on Mars for the first time. And we are going to be there. Falcon 9 will be launching from Kennedy Space Center Pad 39A. This pad has been the origin of more than 90 missions to space, including the Apollo 11 mission that put men on the moon and many space shuttle missions. 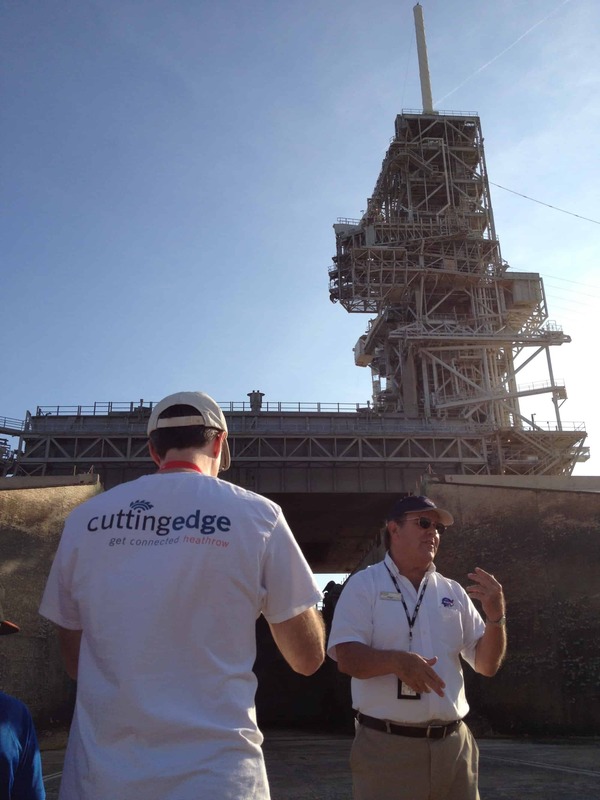 After the shuttle program was discontinued and before Space X leased the pad, you could take a tour inside the fenced perimeter. Naturally, we took that tour. 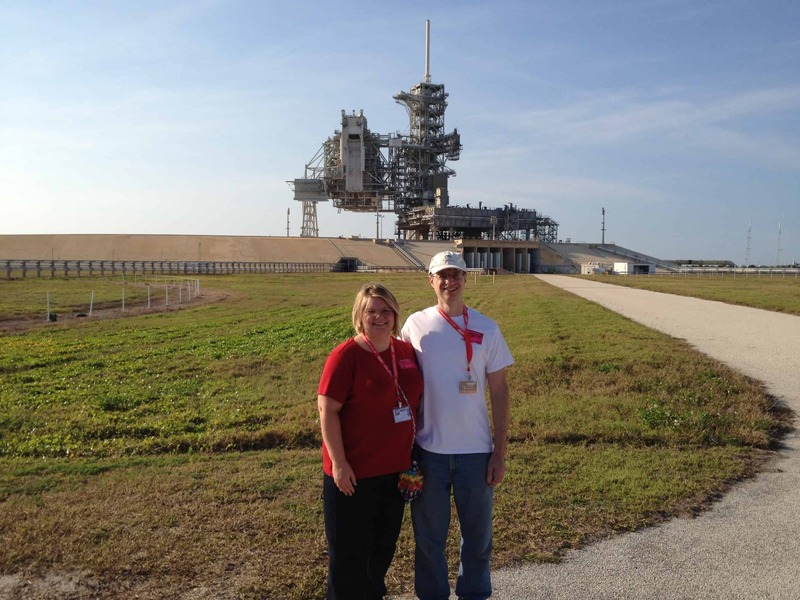 Chris and I with Pad 39A in the background, circa September 2015. Chris listening to our guide tell us the history of pads 39A and 39B. 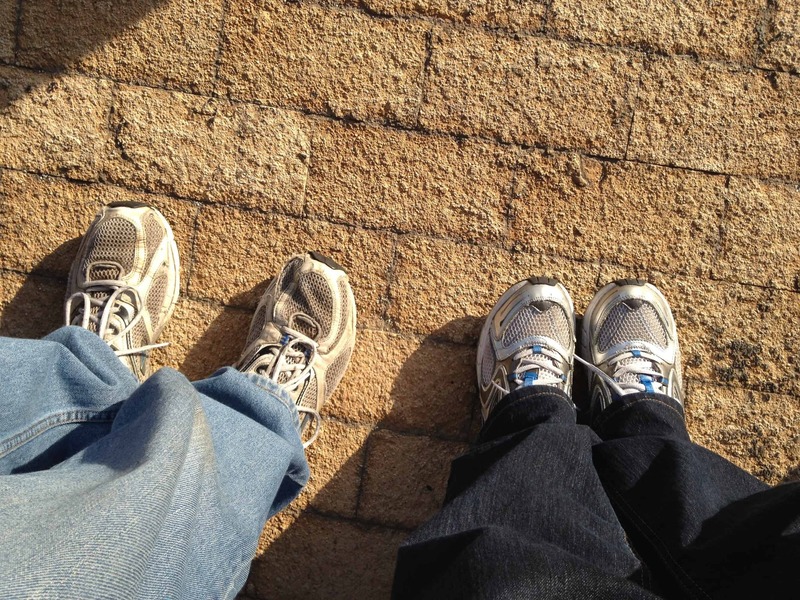 Our feet, right on the line which we weren’t allowed to step past. The bricks are the same kind used in kilns because they have to withstand the heat of the rockets. Tickets for the Falcon Heavy Launch went on sale while we were in New Jersey. We bought tickets to be at the Saturn V center, located 3.9 miles from the launch pad. This is the closest that members of the public can get. The launch is scheduled for 1:30 pm and our pass tells us we must be there at least 5 hours before launch time. It’s a 1.5 hour drive from here to Kennedy Space Center, so we are leaving the house at 6:00 am to make sure we are there in time! Benadryl and AviQ. I have an anaphylactic allergy to fire ants, so if I’m going to be outside in Florida, I always bring these. 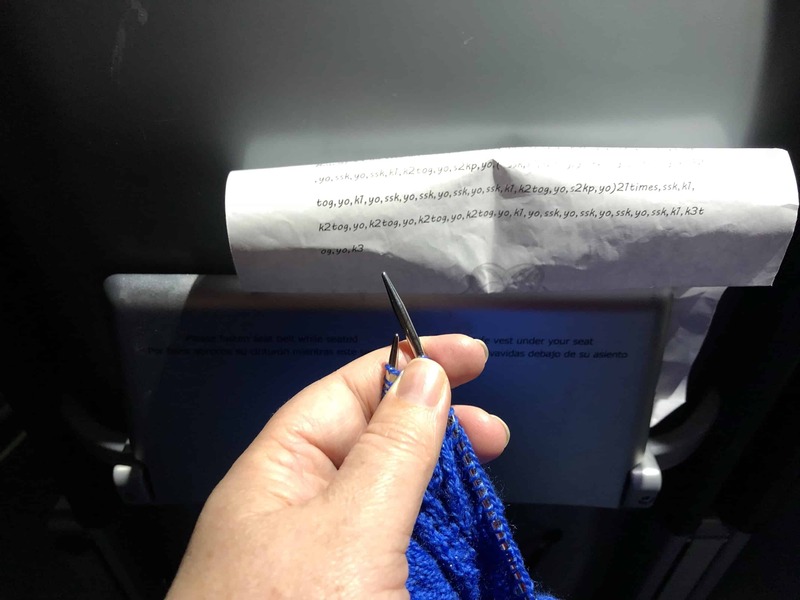 And a knitting project, naturally. We’ve got to be there early and the launch window is 2.5 hours long, so there will be a lot of waiting around! I’ll post more tomorrow evening! I am current — for varying definitions of current, as the rest of this post will discuss — on approximately 225 podcasts. Current means I’ve listened to the entire back catalog, except for current news and politics podcasts. For those, I listened to the 10 most recent episodes when I started subscribing and then listened to current episodes from there. I am also subscribed to many podcasts on which I am not current. I haven’t counted, but there’s at least 400 of them between several categories — Catching Up, In the Wings, Limited Release, Abandoned, and Podfaded. Theoretically, Catching Up means I’m currently listening to the back catalog. In the Wings means I want to listen to those podcasts and will listen through their back catalogs after I finish the Catching Up list. Limited Release is a podcast that, when it was initially released, the intention was to do a specific number of episodes and no more. An example of Limited Release is the Presidential Podcast, which did one episode for each U.S. President. Abandoned is all the podcasts I listened to at one time but which I decided I no longer wish to do so. Podfaded is podcasts that are no longer produced. I move podcasts from the Current list to the podfaded list if they do not release episodes from more than 12 consecutive months or when the makers announce that they will not be releasing new episodes. I do not unsubscribe from podcasts that I abandon or that are podfaded. I used to unsubscribe, but a couple of times I resubscribed to previously abandoned podcasts and then remembered I had listened before and why I no longer do. Sometimes podfaded podcasts come back. If I remain subscribed, the episodes will drop into my feed automatically. Either way, if I try to subscribe to something that is on my abandoned or podfaded list, I’ll get a pop up message from my app telling me I’m already subscribed. I can then find it on my lists and remember why I haven’t been listening to it. So here’s my dirty little secret: I’m a 74 days behind on listening to podcasts. I know this because I am subscribed to two podcasts which release episodes every single day — each episode is under 5 minutes long, btw — and that’s how many episodes my app tells me I have queued from each of those podcasts. 7 days visiting Stacy in Indiana in April 2017. Ever since she moved, I’ve visited Stacy once a year and attended a fiber festival with her (See blog posts from 2014, 2015, and 2016.) This year, I was there for a week. We went to the fiber festival, watched Star Gate, read, and crafted together. It was awesome, and there was definitely no time for solitary time, cut off with earbuds in my ears. 14 days, sick with a terrible upper respitory infection. I was just starting to be sick when I left Indiana and it turned out that I was the sickest I’ve been in a long, long time. My energy was zapped. I slept in the recliner in the living room because I couldn’t breath laying flat. You’d think 14 days sick would be an excellent opportunity for listening to podcasts. However, since I was so congested and my ears were swollen, it was painful to put earbuds in my ears. 4 days helping my sister move and organizing paperwork. I spent more than 4 days working on these projects, but since several of those days she was working while I was packing or unpacking, I am guessing that only 4 were days when I did not listen to podcasts. 7 days for Hurricane Irma. This includes a day of preparations, the day of the storm, and the 5 days after the storm when we did not have electricity at our house. We were able to keep our devices charged with batteries, but we limited our use of them so I didn’t listen to podcasts. 30ish days visiting my mother-in-law. We went to visit for long weekends in July, September, and October, a week at Thanksgiving, and I was there for 6 days at Christmas. While there, I might listen to podcasts for a short time after I woke up and before bed, but other than that I was too busy visiting. 6 days traveling to and from and attending SAFF. This was the third year in a row I’ve rented a house with a bunch of friends. This year, Fredi and I drove together and several other people met us there. While there, we are all busy shopping or taking classes. In the evenings, we eat dinner together then gather around the fireplace for Show and Tell. It’s a fantastic time. 15 days (so far) in New Jersey for my mother-in-law’s funeral. The days I have been here are days I have needed to be present, not cut off by my headphones. Making plans for the funeral, hanging out with family and friends, sorting through paperwork, all mean that I have listened to podcasts for less than an hour a day the entire time I’ve been here. This adds up to 83 days. In addition to these days, there have been many times when I haven’t been listening to podcasts at times I normally would. For example, my friend Shellee has been having eye issues and has had a limited ability to drive as a result. When we are going to events together, I pick her up and we drive together. If we were driving separately, I would listen to podcasts, but I’d rather enjoy her company! The day I was Scouring Fleece recently, I could have listened to podcasts while working. Instead, I did not listen to anything. I simply enjoyed the beautiful weather and the work I was doing and the sounds of birds singing and children playing in the neighborhood. Obviously, I’ve been able to catch up on some of the podcasts since I am less than 83 days behind. However, I haven’t been able to catch up on much. When I first started listening to podcasts back in 2014, I easily had 4 – 6 hours a day filled with activities that I could do while simultaneously listening to podcasts. The fact that I am now 74 days behind is an indication that my life has changed since then. I want more days and times in my life like those represented by the 74 days. On those 74 days I was present, whether for the good or the bad. I was engaged. I need more of that in my life. Today I started abandoning podcasts. I only want the best of the best, the ones that are truly adding to my life. Here’s to greater presence and engagement. On January 13, 2018 my mother-in-law passed away. We got the call that morning and were on a flight that evening. We spent the first week we were here assisting with funeral preparations, attending the services, and visiting with the many family and friends who were here for the services. My mother-in-law was a wonderful person and will be very much missed. I encourage you all to read her obituary, which will give you just a taste of what we have lost. On Sunday, we started on the long, slow process of sorting through her things. We started with a pile of boxes in the basement. Most of the boxes contained things like old checks and bills, as far back as the 1940s. 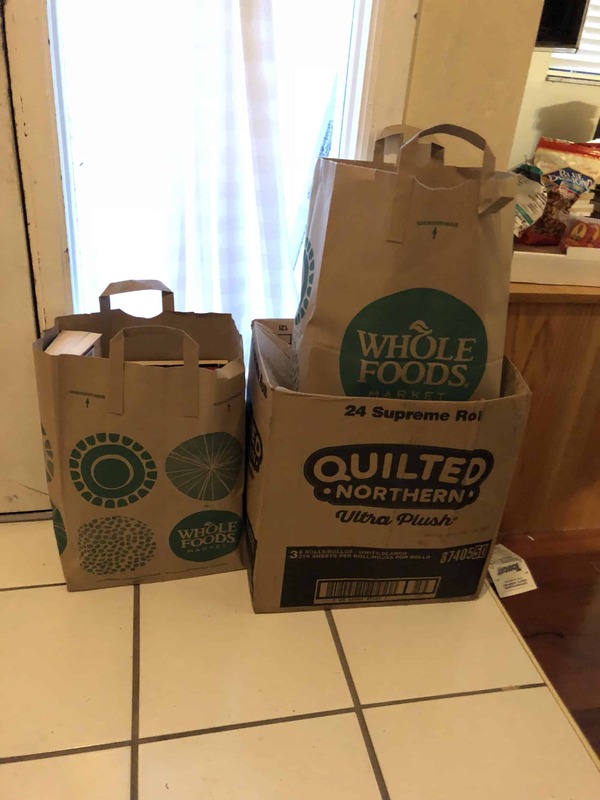 My husband and his brother have been sorting things to save, shred, and recycle. I’ve been working my way through the shredding pile. We have two shredders. One is a small one that can only handle a few sheets at a time and the other is a more robust machine. I’ve been shredding on the small one until it can’t take anymore (which takes 15 minutes) and then switching to the big one. Since the machines are loud enough that it’s difficult for me to hear while I’m working, I’ve mostly been left to my own wandering thoughts. The rest of this post is a sampling of those thoughts. 1980s hair band music is an excellent accompaniment to the sound of the shredder. We’ve filled 7 thirty-gallon trash bags with shredded paper. Each bag holds about 4 of the shredder bins. Each shredder bin holds shredding from 1/2 – 3/4 of a banker’s box. That means we’ve shredded 14 – 21 banker’s boxes worth of paper. My hands are so dry. The forced hot air in the house dries my skin out. The humidity here is so much lower than at home. Handling all this paper dries out my hands. I’m washing my hands A LOT. We’ve recycled at least 5 banker’s boxes worth of paper. My mother sometimes tells the story about the New England winter when she had two kids in diapers. The cold and low humidity always dry you out and she was washing her hands A LOT because of all the diaper changes. My parents were on a very tight budget and hand cream wasn’t something they could afford, so her hands were cracked and bleeding. Just glancing around the basement, I can see at least another dozen boxes my husband and brother-in-law still have to review. I’m very happy that I have hand and body cream that I can deploy against the dryness. Lanolin would be even better. Mmmmm lanolin. If I were at home, I could just go pet that beautiful Corriedale fleece in my office. It’s got lots of lanolin. I think I might spin that Corriedale for the Sweater Spin along / Knit along Beth Smith is hosting on her Patreon. Alice Starmore’s Raven costume, from her forthcoming book Glamourie (Amazon affiliate link), which I’ve had on preorder for several months, would be stunning in that glossy black Corriedale. My degree of crazy may be dependent upon how much more time I spend shredding documents in the basement. This is my third year picking a Word of the Year. If you haven’t heard about this idea before, basically you pick a word as a touchstone for the year. Instead of making resolutions, you let the word guide you. Honestly, when I first heard about it, I thought the idea was kinda crazy. I’m not as intentional about picking a word as many people are. Look on the internet and you’ll find plenty of people describing a process for picking a word. Think about who you want to be, make a list, etc, etc. I have never done a process like that. I don’t do any of that. Every year, sometime in the late fall, a word has just sort of bubbled up into my consciousness. I roll it around in my head for a few days and see what comes up as I think about it. Every year, the word that has bubbled up has felt right. In addition, each year, something has happened to affirm that the word was the right one for me. What does it mean to let the word guide you? Again, there’s a variety of approaches. Some people are very formal, meditating on and journaling about the word. I’m less formal. In 2016, the first year I picked a word, my word was CREATE. During the time I was contemplating whether this was the right word, I got an order in the mail that included a bookmark as a little bonus item. The bookmark has a bright yellow background and the word CREATE in big block letters. I stuck that bookmark to my office door so I would see it multiple times a day. I didn’t do anything else in terms of meditating on the word, but it was right in front of me every day. I was incredibly productive in my creative pursuits in 2016, more than I had ever been. Last year the word that came up was FINISH. It was an interesting word, that played out in unexpected ways throughout the year. I didn’t have a good way of connecting with the word though, and there were entire months when I didn’t consciously think about it at all. My word for 2018 is MOVE. On New Year’s Eve, I got an affirmation that this was the right word for the year. My fortune cookie told me, “It’s time to get moving. Your spirits will lift accordingly.” I’ve actually taped that fortune to my computer monitor so I will see it every day. MOVE is such a dynamic word that can be interpreted in many ways. Move my body by exercising, moving forward, moving on, moving to a new home (I’ve really wanted to move for several years, but circumstances have meant staying put was a wiser choice). It’s an encouraging word for me. Due to various circumstances, I’ve felt rather stagnant for a while. I’m excited about the idea of getting MOVING and out of this stagnant place. It’s only the second day of the year, but so far I’ve found that I’m regularly asking myself, “How can I move right now?” Is there a task I can do to move a project forward? Can I do a little exercise? What would it mean to move right this minute? I’m looking forward to seeing where all this moving takes me!